Today I was working with international bubbleologist, Andrew Suttar, on our creative kids book project ~ The Bubble Story. We began the story a year (or so) ago and a recent trip to the Children's Literature Centre reminded me of the importance of the communication of the childhood knowledge that we carry with us forever through life. Something as familiar as a soap bubble holds in Andrew's hands wonderment and creative intrigue, the essence of learning - and more importantly a path to self-reflexive meta-cognition, so important for personal development. How then do we find a way to see ourselves? 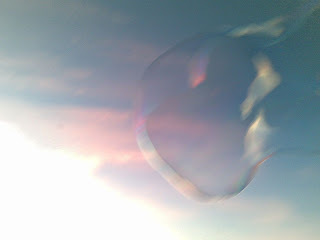 The answer is in the metaphor of the bubble ~ for we are one and in one at the same time. That is the essence of the nature of consciousness. I seem to be working more and more exclusively in the 'qualities' of consciousness, building on from an understanding of the structures of consciousness. In these 'qualities' hides the aesthetics of evolution. What then are the qualities of healthy human consciousness in its bounded form at different stages of development in apithological integration? Now to explain that for three year olds and under.